Rabbits do most of their feeding in the evening and early morning hours when you may not be able to keep a watchful eye on your garden. They can strip the leaves and flowers off a tomato plant. This prevents it from setting fruit or may even kill the plant. 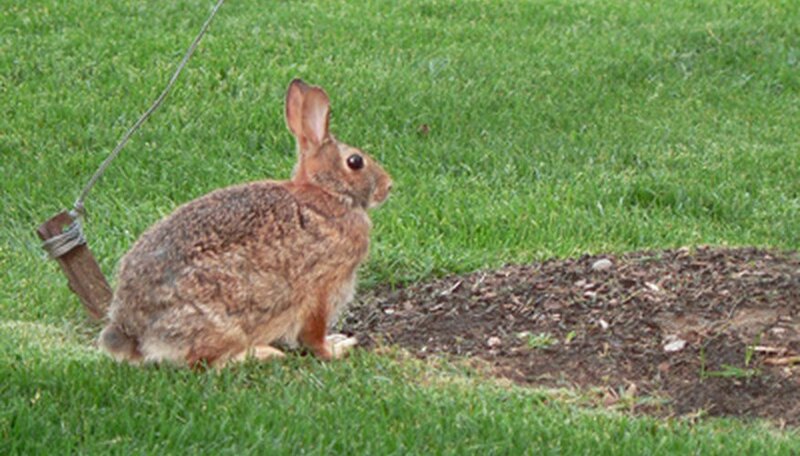 Protecting your tomatoes from rabbits requires that you make the garden inaccessible to the pests. The highest jumper of the rabbits, the jackrabbit, usually jumps no more than 2 feet. Making a fence slightly taller than that keeps your plants accessible to you while keeping even high-jumping rabbits out. Measure the length and width of your garden bed. Add these two numbers together and multiply it by two to come up with the length of fencing you require. Purchase 4-foot-wide chicken wire in the required length for your fence. Dig a 6- to 10-inch trench around the perimeter of your tomato bed. Dig the trench far enough away from the plants so that you don't damage their roots as you dig and so leaves and tomato fruit doesn't poke through the fence. Place a 4-foot-tall wooden stake at each corner of the bed, driving them 3 inches into the ground inside the trench. Place additional stakes between each of the corner stakes. Attach one end of the chicken wire to one of the corner stakes with wire or twine. Warp the rest of the chicken wire around the outside of the stakes, placing the bottom of the chicken wire fence inside the trench. Secure the chicken wire to the other stakes with more wire or twine. Secure the other end of the chicken wire to the first stake with one or two loops of twine. Make it so you can easily untie it so you can open this section to enter your garden to tend the tomato plants. Fill in the trench with the dirt you removed. This places much of the fence beneath the soil surface and prevents rabbits from digging under it and into bed. Use chicken wire with 1 inch or smaller openings in the mesh. This prevents young rabbits from entering your tomato bed. Wrap the extra chicken wire into cylinders and place these over the tomato plants as homemade cages to support the plants. Wear gloves when cutting wire to prevent injury.